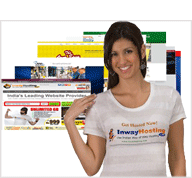 Inway offers All India Web Hosting service with Free helpdesk support and quality service and 99.9% Uptime. We have come upon with cost-effective and affordable technologies for all small and medium businesses all over India which suit the all categories of business enterprises in India with best packages. The advantsgee you get in Inway Hosting are Cost-effective Business web hosting and High level system maintenance thus making a hassle free hosting with inway hosting. Round the clock 24x7 availability. Each user of the service are provided with unique accounts with complete login information. Support updated methodology and technology.